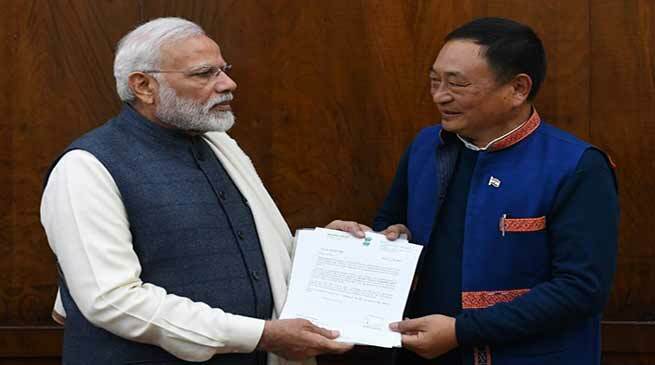 Ninong Ering, MP from Arunachal Pradesh today met Prime Minister Narendra Modi and protested against the Citizenship ( Amendment ) Bill-2016 and apprised him of issue of Siang River. Ering told the Prime Minister that “The proposed Citizenship Amendment Bill has created unrest and ruckus in the North Eastern part of India. Even my state of Arunachal Pradesh has clearly shown dissatisfaction on the proposed bill and people have come out strongly against it. Additionally, MP submitted a detailed research report on “Formalization of the National Policy of Silt Management in Indian Rivers” in context of Siang River.